Applaus makes it on to The Shortlist on the 'Place' setting with a perfect score 15, having five sections of green. He is clearly very well suited to today's conditions and at a current price of around 8/1, I think he is worth a closer look. He runs in one mile and seven-furlong handicap chase in a competitive looking race where a few points in the market cover the majority of the field. Applaus has been running consistently of late with a win, a second and a third in his last five races. He is yet to win over the larger obstacles, but he was a good second over two miles in similar conditions at Newcastle in December and a repeat of that run from a pound lower in the handicap could see him go close in this. He has been founding wanting a little in heavy conditions in his last two races so the return to soft ground today looks sure to suit. Micky Hammond has a good record here at Wetherby over the past year. From the 58 runners he's sent here during that time, he's had six winners (10.34%) and 13 places (22.41%), for level stakes profit of 19.00 and 4.66. Sean Quinlan has been finding a few winners recently and over the past 30 days, he's 3/19 (15.79%) for an Impact Value of 1.31. The Instant Expert report shows how well suited to today's conditions Applus is compared to the rest of the field. Two sections of green are the most any of this rivals have and quite a few of them are a lot higher in the handicap than for their last victories. From looking at the Pace report it appears that jumping may be put to the test over this short trip, as there are a few runners that like to get on with things. Both Caraline and Glance Back are usually at the head of affairs early on and with Pembroke House also pushing them along, this could set things up for one of the others to come from off the likely strong pace. 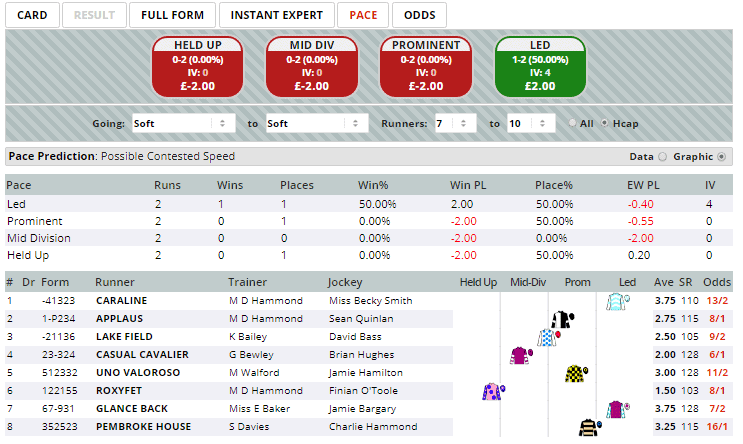 Click here for the 15:05 at Wetherby.